When the weather doesn’t cooperate don’t sit and pout but get up and about. On May 12, 2018 the PFSP held an event at Neil’s Wine House. This event was going to be held outdoors, where bands were going to be playing for your delightful enjoyment. There also was going to be mouthwatering food, palatable drinks, and amiable people. Painfully this event was not able to rise to its full potential. Unfortunately we already had an issue with the event. To begin with, the stage. The stage at Neil’s Wine House was not completed by the time the event was suppose to take place. Other than this the main reason the event didn’t take place was because of mother nature. On May 12, 2018 the weather forecast predicted a 80% chance of rain/thunderstorms. When the weather calls for this you really only have three options in the time period we had. One keep the event going and see if anyone shows up to stay in the rain, two cancel the entire thing, and three try to work things out for the better. We went with option three. As soon as we knew we were going to cancel the event we made an announcement contacting all news and social media outlets. In the matter of seconds we had posted the cancellation comments came rushing in. They went along the lines of, “was so looking forward to this event can we still come and support the pfsp? !” After receiving these comments we knew we had to do something and something fast. We stuck with the original plan, the bands would be cancelled so people didn’t have to stay out in the rain but we would still announce to people that they should go to Neil’s and eat and have drinks. We reminded people that 20% of the total beer purchases would be donated to the Portage Family Skate Park Project thanks to Neil’s continued support. In cessation even though the weather tried to stop us we continued going. We cancelled the bands to allow people to eat and drink in comfort. We also pushed the information that Neil’s would be donating to the PFSP. Furthermore we requested that people still went out and enjoyed their time with family members, while eating substantial food, and donating to a good cause and they did. I would like to thank Neil’s Wine House and Cory Otto for working together with the PFSP and supporting the Skate Park. Lastly I would like to give a big thanks to all the bands that had made time for us even though they didn’t play, Rough Gems, Acyuta, and Jordon Kohel. 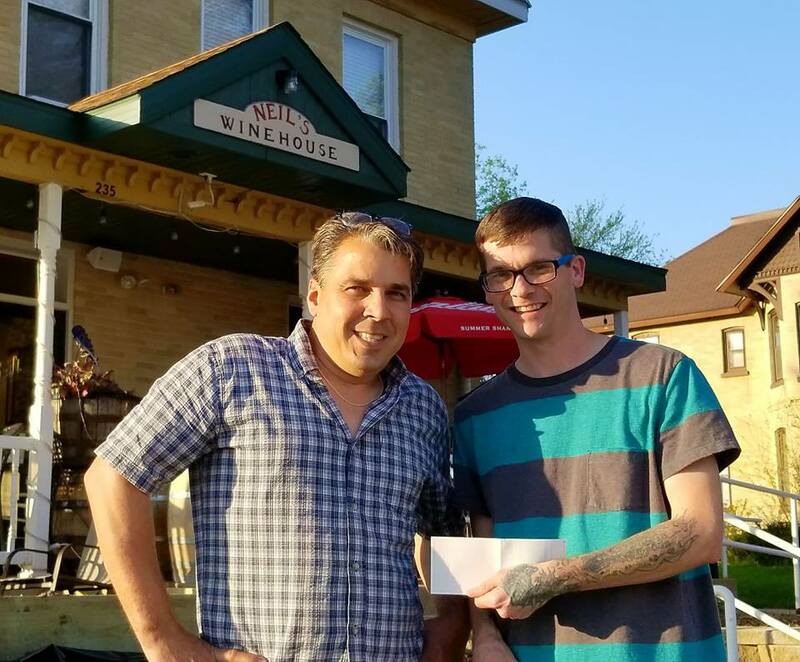 Owner Neil of Neil’s Wine House presenting PFSP president Kyle Little with a donation check from the spring fling event.